You are so right, I LOVE IT!! I never would have noticed this!! Your eye is so good. I love it! One could wax philosophical on this picture, couldn't they? Something about new life working to push through the ice...overcoming obstacles, or some such stuff. This is the happiest winter picture I've ever seen. I think this little guy will help this weeks' blustery weather. You are gifted to see such a miraculous image in a blade of grass. Thank you for sharing it! Awe! Snow dancing! We didnt get any of the "white" stuff here -- some places got a nice sheet of ice though. I should be back next weekend for Herb and Cat blogging... had an unexpected but welcomed guest this weekend. Lovely photo! 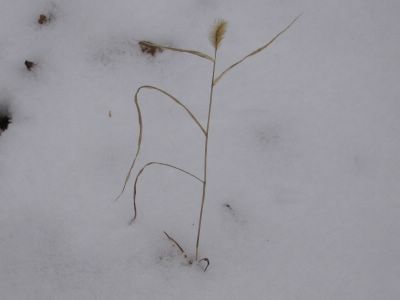 I love the way otherwise drab, dead plants and weeds look so beautiful in the snow - my favorite is Queen Anne's lace, whose seed heads curl up and inward as they dry, and hold a ball of snow like a cup - so pretty!